Robocraft Passes 1,000,000 active users… and then some! Robocraft started as a dream game concept, developed by five friends with a desire to pit robots against each other to the death! Now, Robocraft has become an internationally played online game with a huge community of fantastic and committed gamers. 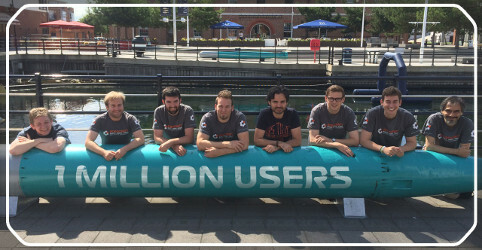 We’re extremely proud to announce that earlier this week we hit 1,000,000 users… and today we passed 1,250,000! Robocraft is spreading like wildfire and the community is growing drastically every day! We at Freejam are focusing our efforts on bringing great new content to the game, as well as communicating more than ever with our gaming community who helped Robocraft become what it is today! I want to thank every single one of you, those that have been there from the beginning (i.e. Madattak, Spilled Chem, Graybierd, aBritishFox, and the rest, you know who you are), our great team of MODS (ProtoBot, SzQ, all of them help make this all work), the toughest critics (MoffKalast, BobDaBiscit, NeoSelf, actually, tons of you, we know you do it because you care), the Honorary Jammers, Samo, Archonius (for your incessant perseverance on suggesting new ideas), and all the new players from Steam. Over 4000 users online all battling at the same time right now, a new record for #Robocraft, awesome!!! The game keeps growing and growing.